Asbestos was first used in Australia in the 1880s. Over the next century as it was mined, manufactured, and used extensively around the country, the industry accepted dust exposure as a normal occupational hazard. However asbestos dust was particularly lethal and soon began to take its toll on those exposed to it. The first wave of illness and death occurred among asbestos mine, mill and transport workers who handled the raw asbestos fibre itself as it was dug out of the ground, milled to separate the fibre from surrounding rock, and then trucked, railed and shipped to manufacturing plants. Mine and mill workers at Wittenoom in Western Australia, at Baryulgil and later Woodsreef in New South Wales were in the front line, working in environments clouded with asbestos dust as they extracted the mineral, milled and packed it for shipment. No less exposed were the wharf workers who handled bags of fibre at Point Samson, Fremantle, Sydney and other ports. 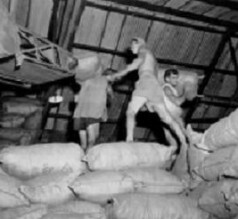 They were exposed to asbestos dust every time they moved the hessian bags containing the raw mineral. Workers employed in the manufacturing of asbestos sheeting, pipes and friction products at James Hardie, Wunderlich and Colonial Sugar Refining Company, CSR, in all capital cities were subjected to heavy exposure during the production processes. Dust control in these working environments was slow to be enforced and never fully effective. As a result, the first wave of asbestos-related diseases occurred in these mining and manufacturing workers: first asbestosis which manifested quite quickly as a direct result of dust exposure, and then lung cancer and mesothelioma with longer latency periods. Their families have also been vulnerable with wives succumbing to mesothelioma as a result of washing their husbands’ work clothing. A second wave of asbestos-related disease has hit workers using products containing asbestos. Because asbestos was included in so many manufactured goods, asbestos-related diseases have spread to building and construction workers, rail workers, power station workers, shipbuilders and tradespersons – such as plumbers, boilermakers and electrical installers – who cut and fitted or dismantled and refitted asbestos sheeting, pipes and lagging or insulation. Spraying asbestos insulation, such as Limpet asbestos, during building construction resulted in gross exposures. Railway workshops, such as the WA Government Midland Workshops, where rolling stock was reconditioned and garages where mechanics carried out automobile repairs were also dangerous workplaces, as were ships which were extensively lined with asbestos insulation. A third wave of disease affects all of society as people are environmentally exposed in their workplaces, homes and the whole built landscape. As the building fabric of workplaces and homes containing asbestos products has aged, it has become more dangerous because the loosened fibres are released into the atmosphere. In this way even schools with asbestos-cement roofs have become potential danger points. Demolition workers face exposure as buildings are torn down, and must work under tightly regulated conditions. Householders renovating their houses built in the twentieth century face risks of which they are often unaware and against which they therefore do not protect themselves. The risk of asbestos-related disease, once thought to be confined to a small number of workplaces, has spread throughout society. This elevated risk will remain until all asbestos-containing materials have been removed from the built environment. Listen to the 30-minute radio documentary Living with asbestos: the Third Wave, produced by Mia Lindgren. Broadcast on ABC Radio National’s Streetstories program 21 October 2007.